During the month-long Google-blackout, while Christopher was disinfecting my blog and reassembling it, I fell for a couple of music videos — one very safe for work, and the other unsafe for most workplaces, except perhaps in Glasgow. Margaret and I often begin our mornings singing “Sargon, Hammurabi, Ashurbanipal, and Gilgamesh” to one another. I posted them to my FB feed when they crossed my path, but now the links are here on my blog, where they belong. This helps set things in order. For those keeping score at home, Margaret and I filed our applications for visa extension at the end of August, so we’re coming up on the end of our fifth month in Scotland without knowing our immigration status, with no expectation that we will hear for several months more. It’s an inconvenience for us — the Border Agency has our passports, so we can’t leave the country — and awkward for our family, whom we can’t foresee being able to visit. Sorry, I meant to say ‘the wonderful Border Agency, our favourite government agency in the whole world’. But we have friends who applied for their residency seven months ago and who haven’t heard; after his having been here as a regular worker for years, his job has come to its end, and he’s looking for a position, but is being turned away because (after all) he can’t prove that he’ll be granted leave to remain when the results come back from the Border Agency. And who would want to hire somebody, only to find out six weeks later that they’ll be deported? But in a grim catch-22, people who are here on a visa don’t have the right to unemployment benefits, so because he’s still waiting for visa approval he both (a) can’t get a job, and (b) can’t get benefits. Margaret and I aren’t in that position, but we can certainly sympathise. Wednesday evening I presented a [slightly] modified, extended presentation of my presentation to the Ars Electronica conference from several years ago; it’s halfway between a meditation on technological change (and the ways that ‘change’ itself doesn’t always change from one change to another) and a call to arms. The tl;dr summary simply calls for technologists and theologians to cooperate toward exploring the possibilities of open-access, open-media publication in the religious sphere. Technologists get to experiment with low-cost ventures in a convenient sandbox of users and consumers with particular interests and a demonstrably strong ‘market’ for publications sympathetic to ‘religious’ interests; the theologically-active participants get to amplify the availability and quality of their communications channels, perhaps learning a lesson or two from what Aaron’s activism might have demonstrated to them. And at the end, my notes trail off from formal presentation to hortatory freestyling. The pitch of the piece veers imperfectly from technological audiences to theological audiences (the core audience that’s literate in both spheres being uncomfortably small). As such, I alternate oversimplifications and under-explanations from side to side — if I were going on Newsnight or The Colbert Show to expound this topic, I’d try to even it out and do a better job clarifying the various dimensions of it. Feel free to correct me in comments, if you want. But in response to popular one request, I’m posting the PDFs of my speaking text and the presentation slides below the fold. I haven’t compared my text to Bloch’s God’s Plagiarist to make absolutely certain I cited every case in which I relied on his specific wording — so you should know that most of what I know about Migne I learned from Bloch, and his is the True Source on all that section, no pretence of personal originality there. And some copyrighted images may have fallen into the slide show, though I tried to stick with Wikimedia or obvious fair use of other sources. So, disclaimers having been made, you can find the PDFs of my slides and talk below. 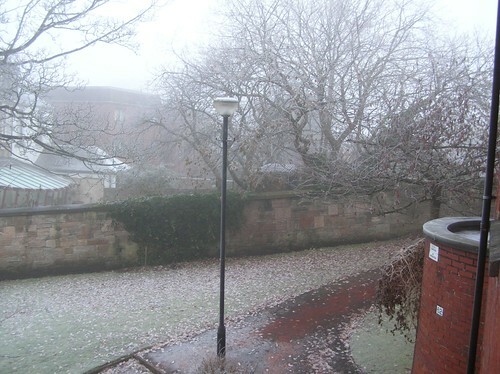 I could be posting about the weather in Glasgow this morning, with snow-slicked slippy pavements so that one gets a backache just from walking with tensed muscles at every step — but rather I’m talking about the widespread perception that ‘exegesis’ and ‘hermeneutics’ concern the production of a correct answer, rather than (respectively) the rigorous analysis of a text and the theoretical articulation of how of interpretation works. I just noticed this since Kelvin Facebook-linked to a post in which Gillan Scott offhandedly observes, ‘As those on both sides fight over the exegesis and hermeneutics (i.e. the correct interpretation) of the Biblical texts…’. As long as biblical studies and hermeneutics are haunted by the longing for an illusory ‘correct interpretation’, we won’t get anywhere; the stakes are too high for combatants who can’t risk loosing their death-grip on their professedly correct interpretations. So part of the reason my work draws less uptake than do those essays and books that promise to guide readers to the proper 13 steps to arriving at the correct interpretation lies in my stubborn unwillingness to play that game. Of course one can always identify particular interpretations as correct relative to certain bounded criteria and premises — but people really want not just to be right relative to people-like-them, but specifically to be able to use their ‘rightness’ to bludgeon others into acquiescence. It won’t work; it has a long, demonstrable history of not working; but since participants in this fantasy gladiatorial sport can’t consider the possibility that their energies amount to nothing more than a charade. Big rewards fall to those who play the charade exceptionally convincingly — but the case for a different approach to hermeneutics gets no traction in a world where most participants mostly want to shore up their preconceptions. There’s something serious I’ve been thinking about this week, though I’ve put off writing anything here. Before I say anything further, it’s important that I emphasise that I don’t want either to co-opt Aaron’s death to my purposes, nor to diminish his life and death to an object lesson. My friends who knew and loved Aaron are still staggering from their loss, and from their awareness of our loss — because as David says, Aaron was a builder. At a time when there’s a virtual arms race of church leaders trying to redefine their theology and ecclesiology better to fit a series of demographic shifts and cultural transformations, why have I not heard any of the soi-disant pioneers call attention to the tremendous loss to the internet’s future, to the beneficiaries of digital innovation, to the ‘public’ of the public domain? Why have they not soberly and humbly taken up the question of where the churches stand relative to the enclosure of common goods by indefinitely-extended copyright periods? Why have they not, at the very least, reminded their blogging, Facebooking, tweeting, tumbling, pinboarding, SMSing, iPod-listening audience that Aaron was agitating on behalf of the very digital affordances that have made their movements possible? There was a big Emergent Christianity conference the weekend Aaron died; did any of the speakers mention him (please tell me ‘yes’). There’s been one Sunday already, and today will be another, in which sermons will be preached around a world increasingly closely woven together through protocols and technologies to which Aaron contributed, on which he worked, for which he stood up; has anyone even heard a prayer of intercession on Aaron’s behalf? The theological ramifications of technology are only just beginning to receive searching theological attention. My colleagues Jana Bennett and Brian Brock have written books about it, Alan Jacobs has been at it for a long time, and I pitched in my essay; but when a force of digital nature (as it were) falls silent, stills, stops, one might anticipate at least a murmur of theological deliberation about what’s at stake, how we cane to this pass, how churches might take a deep breath and rethink their relation to copyright and the commons, to digital technology and the increasing centralisation of digital power (exemplified by the intensification of government authority to examine, collect, and redeploy all manner of digital data from emails to browser histories, without a warrant). Without for a moment minimising other concerns about other dimensions of human well-being — does not this concern touch the lives of far more people than are even inchoately aware of it, who are at risk of being made an example by a zealous investigator or a self-righteous media corporation? Some of these have been themes of mine for a long time; Jamie Boyle and I met when he introduced a talk I gave five years ago, arguing that the churches should be at the forefront of challenging copyright extension and embracing (free) digital publishing and distribution; Larry Lessig and I met through my initiative to crowd-source an audio version of his book Free Culture nine years ago.. So, sorry if what I say is repetitious and predictable. But the churches have an intrinsic interest in communication, free communication, profligate communication. That interest is not simply limited to ‘evangelism’, since our faith that all knowledge of the truth is theologically important warrants an unwavering, unflinching commitment to encourage practices of critical deliberation and exploratory reasoning (even when that exploration leads where we would not ourselves go). Few thigns could be more important to the churches than full capacity to communicate online. Heck, denominations and religious cranks used to (and still do) buy and build and maintain television broadcast networks and radio networks, and print publication plants. How can we not be deeply invested in the well-being, the sturdiness of a communication medium ideally suited to the purposes of a non-profit educational communication endeavour such as ours? And the churches have an essential theological commitment to justice, justice not just for the privileged stockholders and financiers but for the people whose only access to the prerogatives of wealth comes through generosity, sharing, and openness — libraries, clinics, parks, public (and, once upon a time ‘church’) schooling, shelters, soup kitchens, and so on. The churches’ stand on digital freedom owes a preferential option to those with least resources and least access. The enclosure of vast amounts of human knowledge and imagination in dusty reserves, guarded so as to protect that last trickle of royalties to bloated corporations contravenes the ethics of the Torah and the prophets, the teaching of Jesus and Paul. And the churches have a fundamental commitment to humanness, to compassion. The churches, above all communities, should care when human souls are threatened, overshadowed, brought to the breaking point of desperation — especially when those who threaten, overshadow, and break such souls do so behind the façade of justice. If we continue to serve Jesus’ promise of the fulness of life, or life abundant, of a grace that sustains and nurtures the greatness of human capacities, then the churches have an obligation to stand up and call to account any force that crushes what is most extraordinary, most promising, most ardent in striving for mutual well-being. The premise that runs through the Scriptures proclaimed in synagogue and church day after day holds that God shows no impartiality, and that God in particular does not take the side of wealth, power, impersonal government processes, no matter how pious their professed intention. If you can read this, and if you have the very least awareness of what Aaron was up to, I hope that you too are wondering why the churches are silent. I hope that perhaps this was just a respectful interval of restraint, allowing a beautiful life of integrity and brilliance and sorrow to hold centre stage for a while — and that soon we hear the churches speaking out thunderously on behalf of the commons, of justice, of human well-being rather than corporate profits. I hope the churches remember Aaron as someone who taught, in so many ways, the kind of example that the churches should be supporting and living up to. Our fair city has been promoting its affection for the winter seasonal holidays for weeks now, and only recently did I realise why the posters irritate me so much. In this city with its glorious heritage of art and design, it’s positively mortifying to have to look at a poster with such execrable kerning. 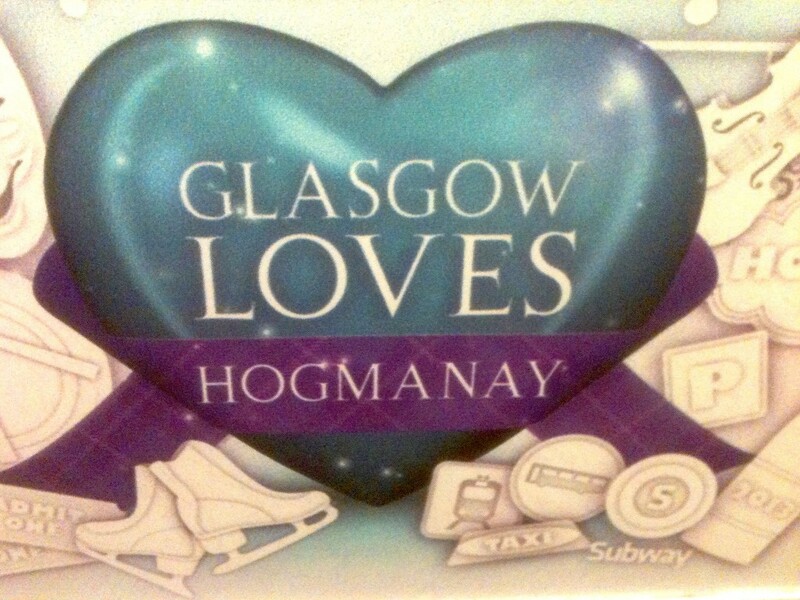 The kerning isn’t even remotely adequate; the word looks as though it were the phrase ‘Hogm A Nay’ (which could plausibly look legit to a visitor with no knowledge of Gaelic). Come now, Council, between these posters and the architectural designs for George Square — click through and support the grassy restoration — this has been a weak winter for a beautiful city. By now, most everyone who would make a way to this blog knows that Aaron Swartz appears to have committed suicide Friday. Aaron grew up in suburban Chicago, so our circles overlapped both online and spatially; as far as I can recall, we were only in the same place at the same time once. 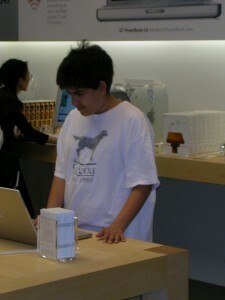 In 2003, Josiah and I went to the opening of the Michigan Avenue Apple Store in Chicago, and while we were there I recognised Aaron. Apparently — though I didn’t remember this — Si went over and introduced himself, and I took a picture of Aaron browsing at a PowerBook. Apart from that, and knowing some of his friends, that’s all that connected us; Aaron didn’t know I existed. When I woke up and began browsing yesterday morning, the news had just broken. The only media source that mentioned it was the MIT newspaper; as my tech friends woke up one by one, Twitter trembled with their shock and grief. Most knew that depression numbered among Aaron’s complexities; some remembered him blogging thoughts about suicide. No one saw it coming. In the hours since we woke up to this intensely sad news, people have twittered and blogged and Facebooked in every way one would predict: unanimous grief and shock, lots of memories, many monitory reminders to keep in touch with the people you love, some self-blaming, some instructional columns about ‘signs’ or ‘what to do’ or ‘what not to do’, some angry criticism of how other people try to deal with the finality of a friend’s death. I don’t have the slightest idea how much the vastly overwrought federal criminal charges that Aaron faced affected him, but they certainly make a plausible hypothetical trigger on the second anniversary of his dramatic arrest. Some have begun a drive to expel the prosecutor from her office; Larry Lessig sees a direct connection between her miserably poor prosecutorial judgment and Aaron’s suicide, and since Larry knew both Aaron and the details of the case better than almost anyone, his word carries a lot of weight with me. I don’t favour demanding that the prosecutor be expelled from office. Bad as her sense of this case was, she too has a life and family and friends, and we can’t know the extent to which her zeal contributed to Aaron’s death. (I do think it would be a mistake to re-appoint her, still worse to promote her — the public facts of the case show a dangerous lack of perspective, which could well lead to further misjudged prosecutions.) Better she not be given a cause to blame others, to turn away from soul-searching to bitter resentment; better that this be a sign of her competence than a moment for vengeance. Suicide defies our capacity to reason about it (a bitter irony, given Aaron’s own brilliantly logical thought). We want to know so much more about it than we possibly can; the people we most need to learn from will never speak to us again. We can draw conclusions from the situations of people whose suicides left them yet alive, but that’s still a different thing than knowing what we need to from people who made sure their suicides were effective. Suicide – and its malign companion depression — affect us in ways greater, stronger than we can make sense of. When ancients talked about people being possessed by powerful alien spirits, they correctly described the force of these powers on mere human capacities (if not correctly identifying the ontogeny of the force). If we eventually learn something about suicide and how we may protect ourselves and our friends and loved ones from it, we will probably learn something that will catch all our grief-stricken pronouncements off target. For now, we struggle against something we can’t know enough about, and each of us will respond to our relative impotence by pulling counsel out our own repertoire of (falling-short) best ideas. And — for now — we’ll continue to lose our hold of some of the people who matter most to us. That saddens me. About a month ago, my blog started throwing Google alerts at everyone who visited — which meant that everyone who visited sent me earnest warnings that my site was the source of all manner of dire and vile infectious malware, and did I know? I did, and I have prevailed on philosophical theologian and web adept Christopher Roussel to conduct a far-reaching dissection, disinfection, revivification, and perhaps even an on-going vivisection of Random Thoughts and some of the other web content (we may transform Limature and the Disseminary and maybe even Theological Outlines from Movable Type — for which we’ll always be thankful to Ben and Mena — to WordPress, for which we’ll always be thankful to Matt. There are good people at the heart of the Web!). Between then and now, I’ve bid goodbye to three colleagues (the Kent Three — Rich King, Yvonne Sherwood, and Ward Blanton), finished marking for last term and thrown myself into preparing two new courses (shared) for this coming semester, visited exotic Helensburgh with Margaret, finished a revised version of ‘The Strong Right Arm That Holds For Peace’ for a collection of essays to be published later this year, cooked up a gamification scheme for the Texts & Cultures of the Bible course on which I’m working with my sole remaining biblical staff colleague, preached once or twice, and hammered away at a couple of other projects. The most important thing that happened in the interim, from my family’s perspective, has been my Mom’s moving to a new apartment on the mainland of Massachusetts. I’m calling this out here because — at this great distance from Nantucket — I was of absolutely no use in this process. My sister Holly and my cousins and my aunts (literally; I’m not just making a Pirates of Penzance reference, though I’m happy so to do) did all the background work, all the checking-out and negotiating, all the moving, and handled all the stress that attends such efforts. The commonplace word for such labour is ‘thankless’, but I refuse to allow her to go unthanked. Hol, you made it go, and I was just peering over from across the sea saying ‘Uh-huh’ or ‘Oh, I suppose so’ to Margaret, who operates the communication machines at this end. There aren’t thanks enough for that very extraordinary push — and though my acknowledgement be inadequate, it will at least be on the public record that I admire and appreciate all you’ve done. And hey, Mom, we’ll come visit as soon as we can — as soon as the Border Agency gives us back our passports.